Always posting last minute recipes around the holidays, that's me! 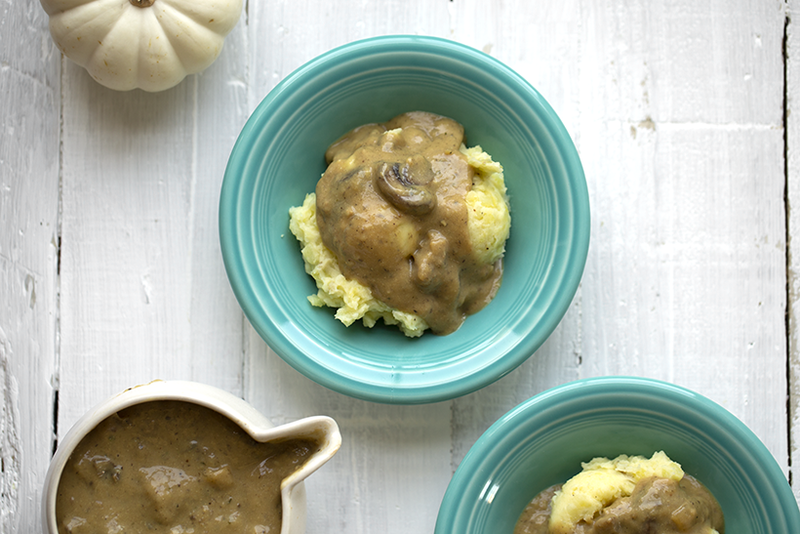 Well this Easy Vegan Mushroom Gravy is worth it. This is the time of year when I remember just how easy a few of my favorite comfort food recipes actually are to make. Mashed Potatoes and Gravy being one of them! 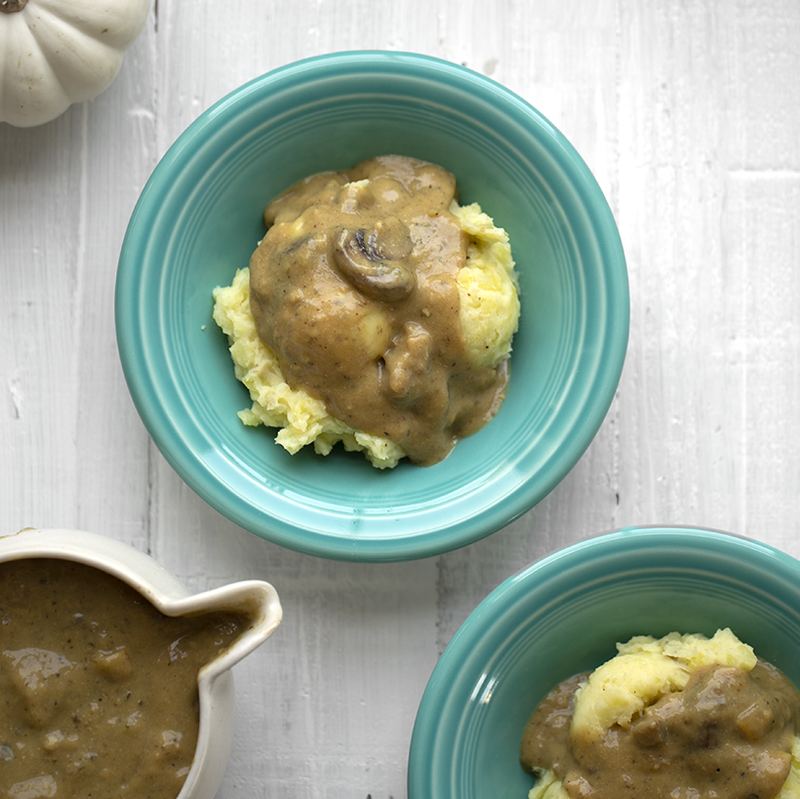 This gravy is rich and savory with mushroom flavor throughout. You can whip it up in just a few minutes and be pouring it over everything on your holiday plate. 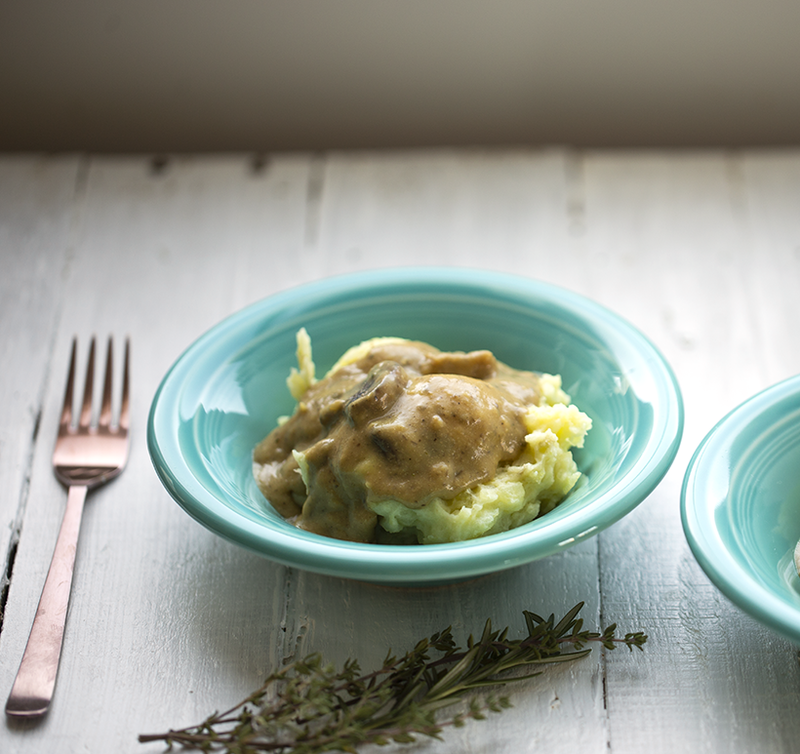 Get the recipe, a how-to video + and my 1-2-3 mashed potatoes too!.. First things first. 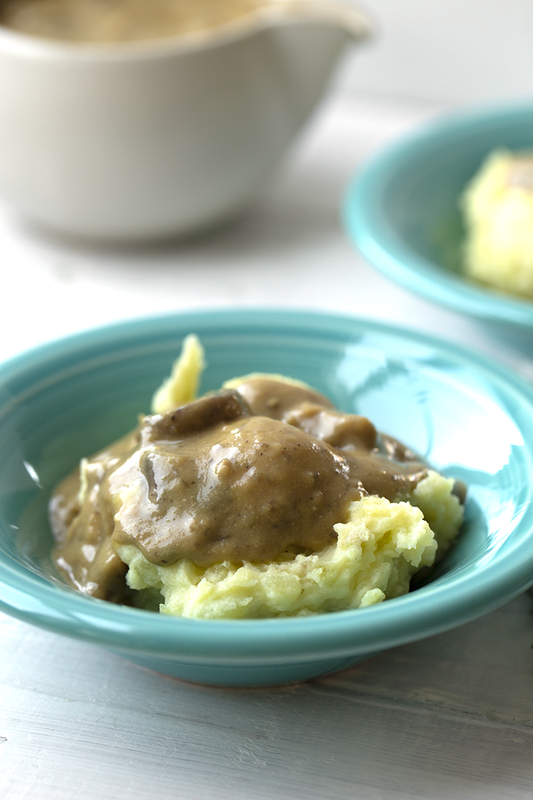 I have my big mashed potatoes post here, but really, it just takes three easy steps to make them..
1. Prep. Scrub, peel and roughly chop white potatoes. 2. Cook. Bring a big pot of salted water to a boil. Drop potatoes - boil on medium, until tender enough to break with a fork. 3. Mash. Strain potatoes and add to a medium, deep bowl. Add vegan butter, vegan non-dairy milk and salt and pepper to taste. Start mashing! Serve. 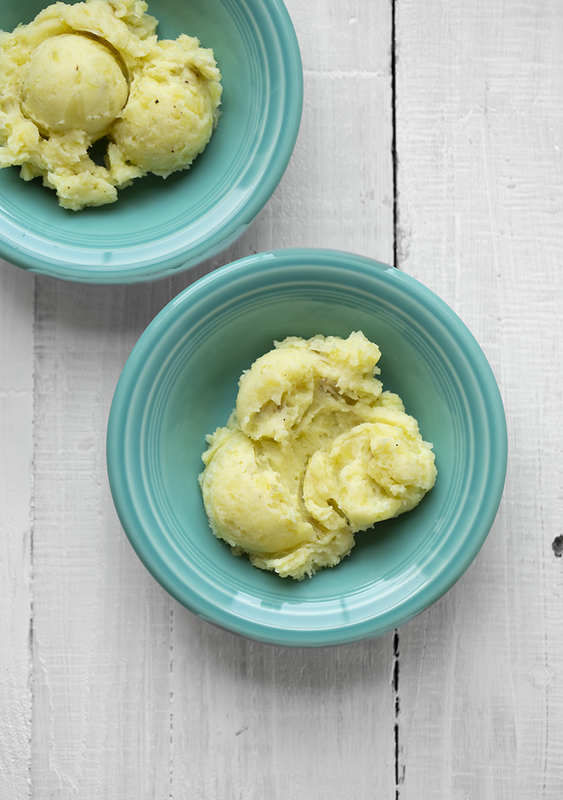 Tip: start with a tiny splash of butter and see how much you want/need as you mash. Butter: I like about 1 Tbsp vegan butter per large potato. 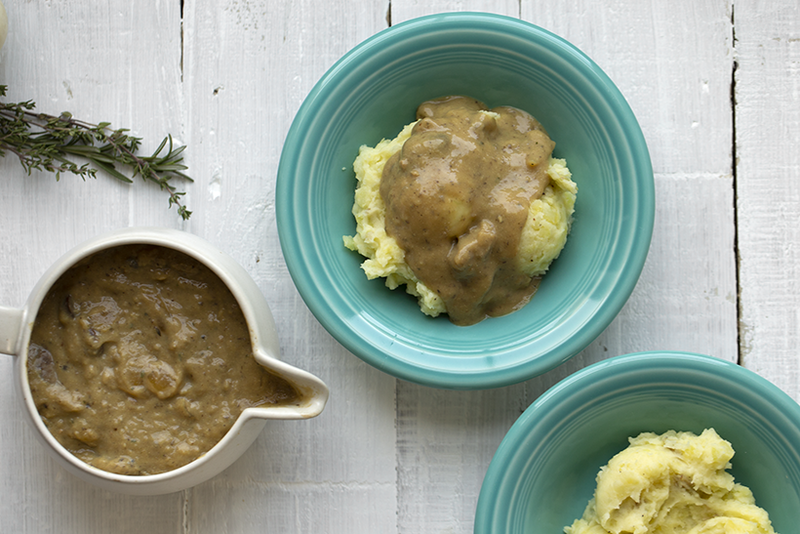 Gravy is one of those recipes that tastes way more fancy than it actually is to make. Rich and savory with layers of flavors like herbs, pepper, savory bits, garlic and onion. 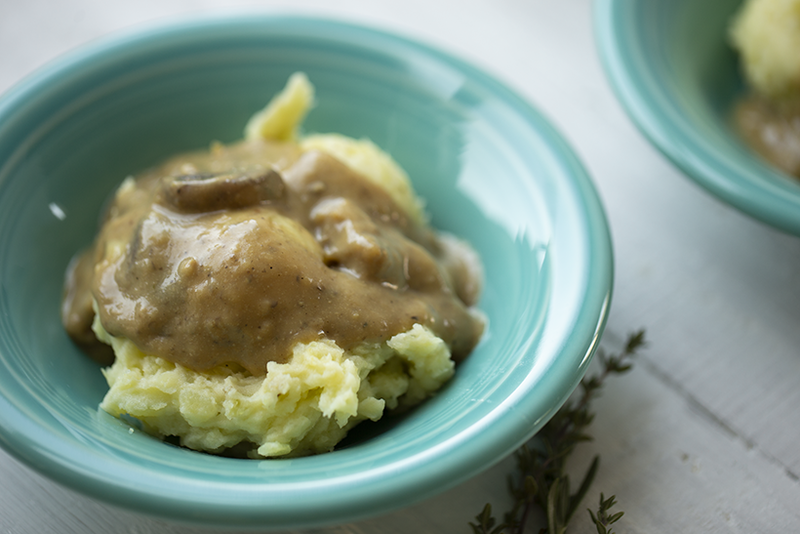 I love adding mushrooms to my gravy, as shown today, though they are optional. I also add a secret ingredient: some vegan bacon or sausage bits! You could chop tempeh bacon or break off pieces of some vegan sausage like GimmeLean brand. 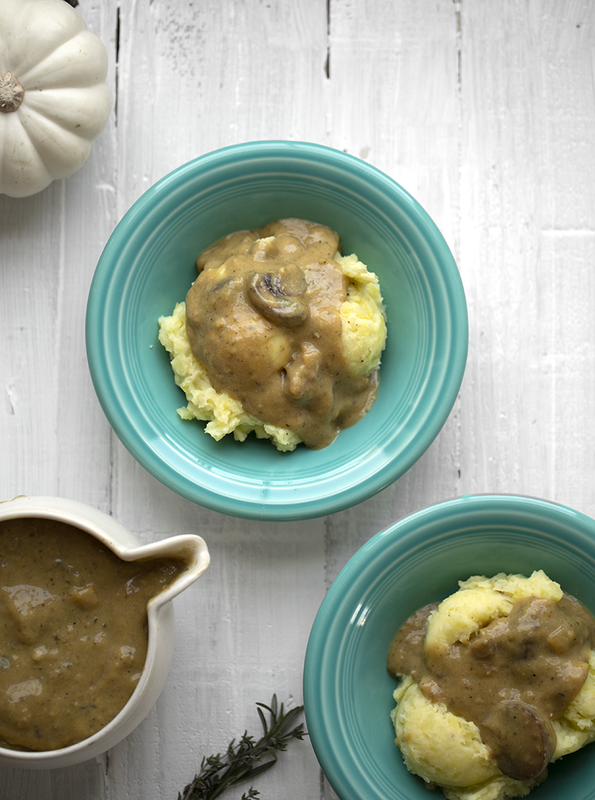 I like this because it mimics the 'savory bits' in a non-vegan gravy, while adding another layer of flavor. Broth or water? 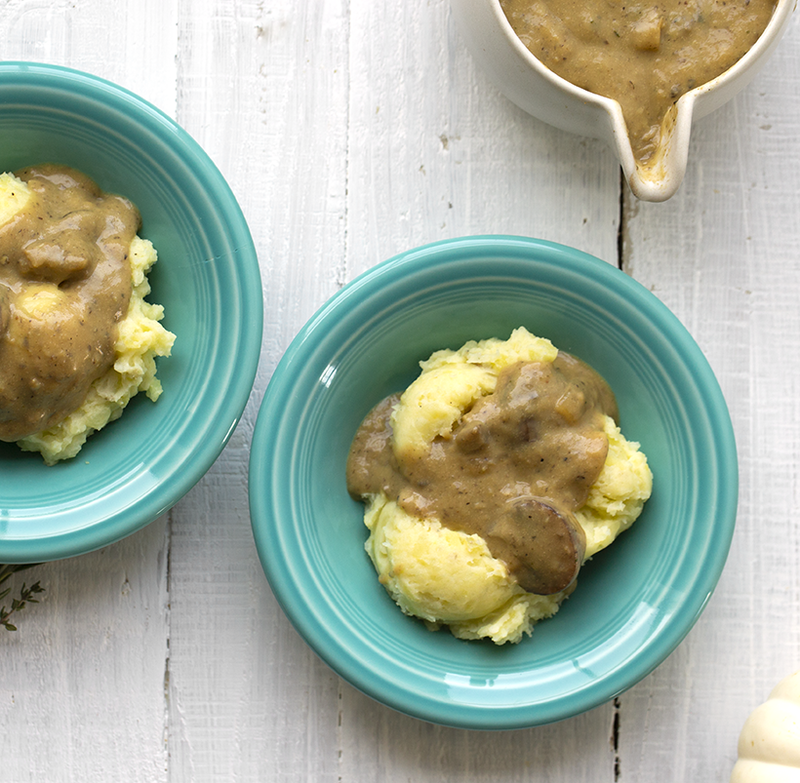 I actually prefer water for my gravy because I think the other ingredients add so much flavor and some store-bought veggie broths can mess with the flavor. But you can play around with both versions and see which you prefer. 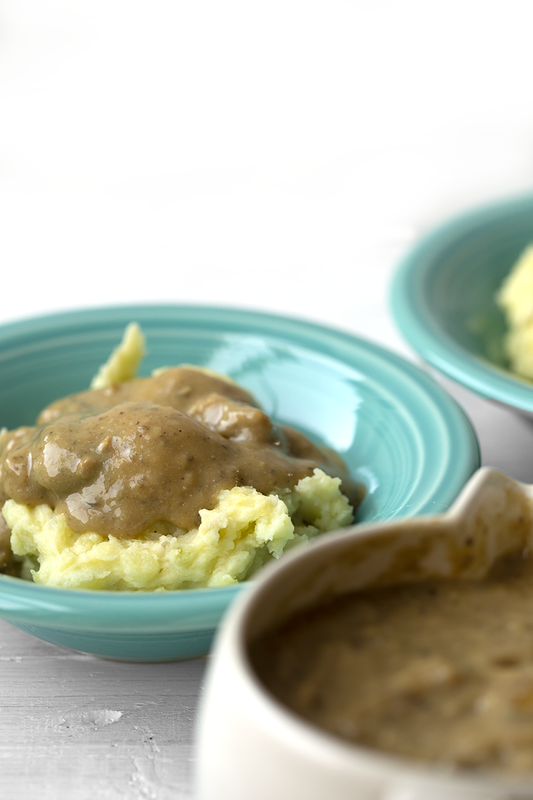 Gravy is delicious on potatoes and it is really good at perking up veggies and any vegan faux "meats" that you may be serving. 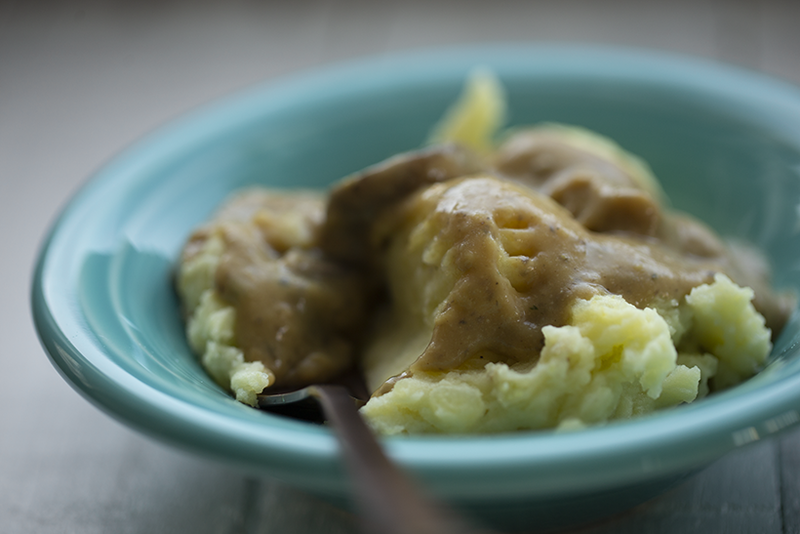 Or even something like tofu or tempeh would be delicious with gravy. If you need more Thanksgiving recipes, be sure to hop over to my Thanksgiving Recipe Guide here. 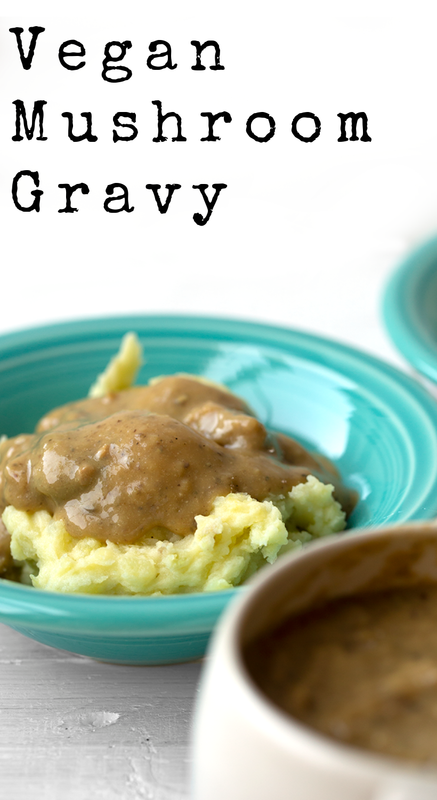 Watch me make this gravy..
Hope you guys have a happy, relaxing holiday week! 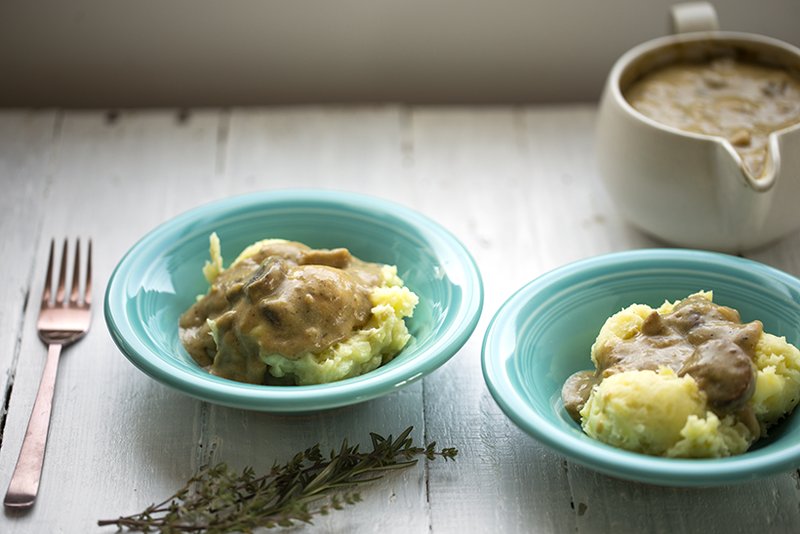 Rich and creamy mushroom gravy with so many layers of savory flavor. Vegan. Warm a large soup pot over high heat. Add the oil, onion and garlic. Saute until the onions are tender and browned. Add in the thyme, rosemary and mushrooms. Saute for a few minutes, until the mushrooms are browned and tender. Turn the heat to low, then add in the tamari. Add in the water. Then gradually whisk in the flour and nutritional yeast. The gravy will slowly being to thicken as you whisk. Keep whisking until silky. Add salt and pepper to taste. Turn off heat. 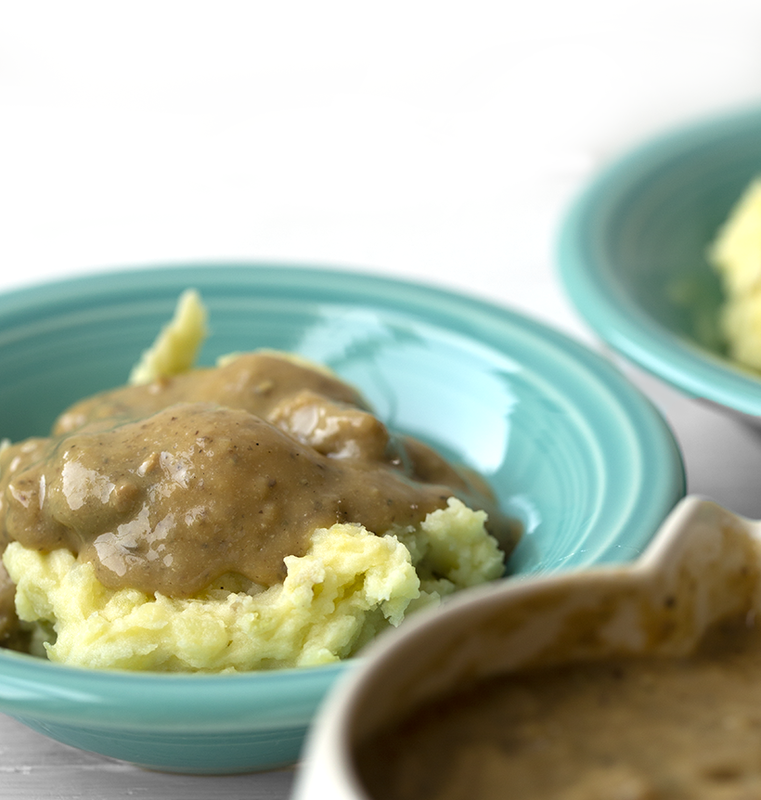 Transfer half of the gravy to a blender and pulse a few times to combine everything. Pour the blended gravy back in with the remaining chunky-mushroom gravy. Stir together to combine. Simmer on low for a few more minutes, then turn off heat and transfer the warm gravy to a serving dish. Serve warm.